Does this have a familiar ring? “The soul by nature is like such a desert, or like a traveler wandering through such a desert. It is thirsting for happiness, and seeking it everywhere, and finds it not. It looks in all directions and tries all objects, but in vain. Nothing meets its desires.” (Albert Barnes’ Notes on the Bible) If Jesus is alive in your “heart” then Albert Barnes comment is a memory that haunts you from time-to-time. However, if Jesus is alive in your “head” then it is not a memory but living events in your day-to-day living. 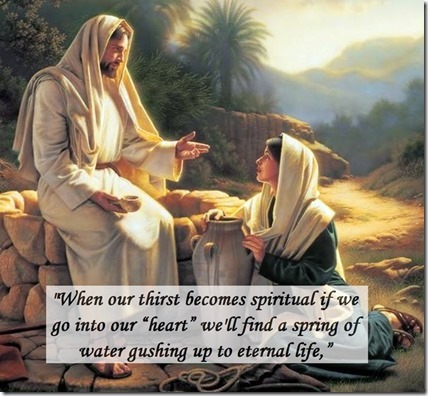 Happiness, joy, love, hope, and peace are not the source of thirst the need for Jesus to be alive in the “heart” is the source.